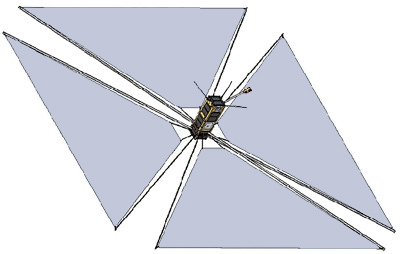 CanX-7 (Canadian Advanced Nanospace eXperiments 7) is a demonstration mission involving a 3U-CubeSat nanosatellite that will incorporate a lightweight, compact, deployable drag sail under development at SFL. The mission is funded by Defence R&D Canada (Ottawa), NSERC and COM DEV Ltd. The mission will demonstrate the drag sail's customizability, modularity, stowability and effectiveness at achieving the deorbiting requirements of the IADC. The results will then be used to create a low cost, modular, and customizable deorbiting device for nanosatellites and microsatellites in low Earth orbit, thus alleviating the programmatic and technical risk to space missions when using satellites of this class. The sail was successfully deployed on 3 May 2017.